The Fourth Annual Cayuga Lake Triathlon Sports Medicine Conference will be held on August 3rd, 2013 at Ithaca College’s Athletic & Events Building in Ithaca, NY. The Cayuga Lake Triathlon will take place the following day, Sunday, August 4th, for anyone interested in competing. The conference this year will include presentations from 13 medical specialists including Sports Medicine Physicians, Orthopedists, an Athletic Trainer and many more. Topics will include Triathlon Injuries and Mountaineering Medicine, Shortness of Breath in the Athlete, Bike Fit and more. Anyone is welcome to attend the conference. Medical professionals and coaches may earn 6 CME/CEU credits for attending. We will also have three free lectures for race registrants and anyone not attending the conference, running from 10am - 11am that cover: The Value of VO2 max testing, Performance Benefits of Strength Training for Triathletes, and Fueling Your Tri – Nutrition for Before, During, and After the Race. If you would like more information about the conference or you would like to register to attend, please visit: http://www.cayugamed.org/SM_clthome.cfm. A discounted fee will be offered to all those who register before June 1st. The fourth annual USA Cycling Race Director Summit offered a new twist for the more than 70 attendees who converged to discuss the 2012 season and growth of the sport domestically; the increased participation of more than a dozen of the nation’s top team directors. Held for the first time in Salt Lake City due largely to the support of the Larry H. Miller Tour of Utah, the annual summit saw not only race directors but 13 Pro Continental, Continental and Domestic Elite Team directors in attendance as well as several mountain bike stakeholders. The group discussed a variety of topics throughout the three-day event hosted by the Salt Lake City Sheraton, including: sponsorship, head injuries, risk management, televising cycling and governance & rule changes. Small constituent groups also broke out to discuss scheduling, applications, team branding and on-site activation. The group also capitalized on networking opportunities over meals sponsored by Visit Salt Lake, Backcountry.com, DNA Cycling and PSA Sports. Following USA Cycling CEO Steve Johnson’s State of the Sport address, a detailed discussion of USA Cycling’s new results & rankings program was led by Tom Mahoney, results & rankings manager. An insurance and risk management presentation was aimed at race directors while a UCI team break-out session ran simultaneously. Friday’s afternoon session was dominated by sponsorship panel led by Matt Wikstrom, V.P. of Wasserman Media Group and Steve Miller, Senior V.P of the Larry H. Miller Group. Dr. Anna Abramson, founder of the Medicine of Cycling group, also offered a moving presentation on prevention, warning signs and consequences of head injuries in cyclists. Saturday morning’s focus turned toward media as USA Cycling Communication Director Andrea Smith moderated a panel of experts on the topic of new media. Jackie Tyson, president of Peloton Sports, Allan Padgett, CEO of Tour Tracker and Jesse Hammond, USA Cycling’s new media manager offered tips on how to capitalize on social media, the emergence of mobile applications, reaching out to the ‘new’ media and more. Medalist Sports’ Jim Birrell then joined forces with Dave Chauner of the TD Bank International to lead discussion on cycling and television. After lunch and a brief break-out session, participants heard from USA Cycling staff on branding and bidding for national events. A panel on moving from a national to a UCI-level event including Karen Weiss, executive director of the Tour of Utah; Don Edberg, director of the Wisconsin Off-Road Series (WORS) and Sean Petty, COO of USA Cycling wrapped up the event on Saturday afternoon. For USA Cycling the summit marked the completion of its annual ‘summit season’which included face-to-face dialogue with Local Associations, Sport Committees, junior and high school racing stakeholders and race directors. Colorado Springs, Colo. (Nov. 16, 2011) – The fourth annual USA Cycling Race Director Summit offered a new twist for the more than 70 attendees who converged to discuss the 2012 season and growth of the sport domestically; the increased participation of more than a dozen of the nation’s top team directors. 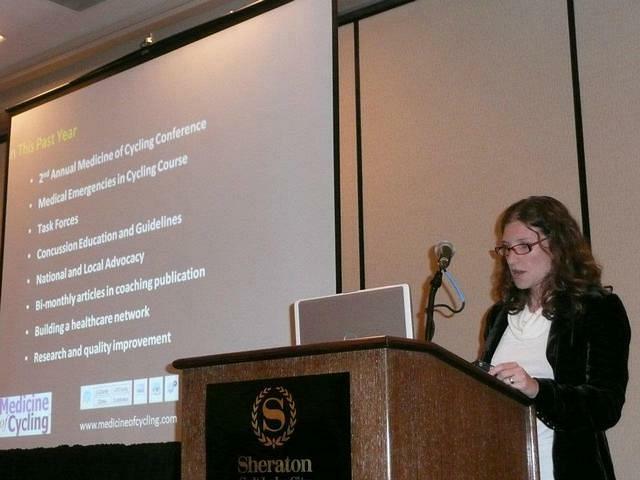 For USA Cycling the summit marked the completion of its annual ‘summit season’ http://www.usacycling.org/news/user/story.php?id=7143 which included face-to-face dialogue with Local Associations, Sport Committees, junior and high school racing stakeholders and race directors.